The world risks losing new medical treatments for osteoporosis, cancer and other human ailments if it does not act quickly to conserve the planet’s biodiversity, a senior United Nations environmental official said Wednesday. Earth’s organisms offer a variety of naturally made chemical compounds with which scientists could develop new medicines, but are under threat of extinction, said Achim Steiner, executive director of the U.N. Environment Program. Pope Benedict XVI spoke to the U.N. General Assembly on Friday, warning nations against undermining the authority of the United Nations by acting unilaterally. 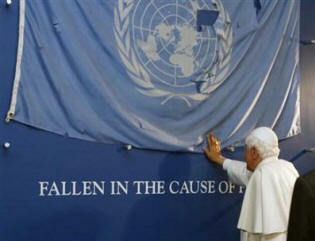 The Pope also found time to bless the U.N. flag. “Countries that act unilaterally on the world stage undermine the authority of the United Nations and weaken the broad consensus needed to confront global problems, Pope Benedict said on Friday. The international community must be “capable of responding to the demands of the human family through binding international rules,” said the 81-year-old pope, who spoke after meeting privately with U.N. Secretary-General Ban Ki-moon. The Pope’s comments are of little surprise, given the fact that he has previously called for a “new world order” to combat terrorism, environmental problems, as well as economic imbalances during his Christmas 2005 speech. Pope John Paul II also called for a new world order in a 2004 new years speech. Addressing an emergency session of the Security Council in New York after four days of fighting in which 96 Palestinians have been killed, many of them civilians, Ban also called on Gaza’s Islamist militants to stop firing rockets. The 1.5 million Palestinians crammed into the blockaded, 45 km (30-mile) sliver of coast, enjoyed a relative respite early on Sunday from Israeli air strikes and raids. Two Israeli soldiers died in a ground assault on Saturday. An Israeli civilian was killed by a rocket in a border town on Wednesday. “While recognising Israel’s right to defend itself, I condemn the disproportionate and excessive use of force that has killed and injured so many civilians, including children … I call on Israel to cease such attacks,” said Ban.